Townsville is Australia’s largest tropical city with a population of 196,000 and one of the highest residential growth rates in Australia. The city is the capital of a vast resource rich region in the north of Queensland. It is located on the beautiful Great Barrier Reef coast, on the doorstep of tropical rainforests and the gateway to the rugged west which features historic and present day mining towns and vast cattle stations. This is the perfect place to take a day trip when you are vacationing in Cairns for the week. Townsville falls into the “dry” tropics with year round average temperatures of 19.5 degrees celsius (minimum) to 28.7 degrees (maximum) and a rainfall fo 1204mm per annum. The Port of Townsville is one of the busiest in Australia. It is the export outlet for copper, silver, lead, zinc and nickel, as well as beef, sugar and molasses. Castle Hill, a large granite monolith rising 286m above the city centre, is only just over a metre short of a mountain. Research and educational establishments include the James Cook University, the Australian Institute of Marine Science, the CSIRO Tropical Agricultural Research Station, the Great Barrier Reef Marine Park Authority and the headquarters of the northern refion of the Queensland National Parks and Wildlife Service.It is also an important Australian defence centre with a huge army base and RAAF base. Townsville is located just over 1500 km north of Brisbane (QLD’s capital city) by road, or 1.30 hours by air. Jetstar and Virgin Blue fly direct daily services from, Brisbane to Townsville also, four direct services per week from Sydney to Townsville, Plus Three direct services per week from Melbourne to Townsville. While staying in Townsville or at the airport you may need car hire so you can get around the city town. 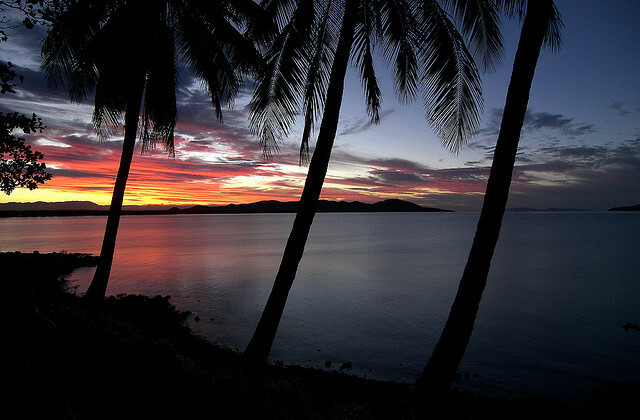 Looking for Townsville Accommodation in this simply picture-perfect city? Townsville rests by the coast of Cleveland Bay below Castle Rock, which towers above it at 300 meters. To the North lies Mission Beach; to the West, there is the town of Charter Towers and to the South, lies the farming town of Bowen. Townsville features a delightful mélange of old and new, with a fascinating history reflected by the assortment of exhibits in its various Museums. Nearby towns also reflect ancient architecture, preserved through the ages. This city, which is widely known as “Australia’s Largest Tropical City,” lies within the nation’s most diversified areas in terms of scenery, flora and fauna. This assures the visitors that they will have a variety of activities to choose from in their holidays.